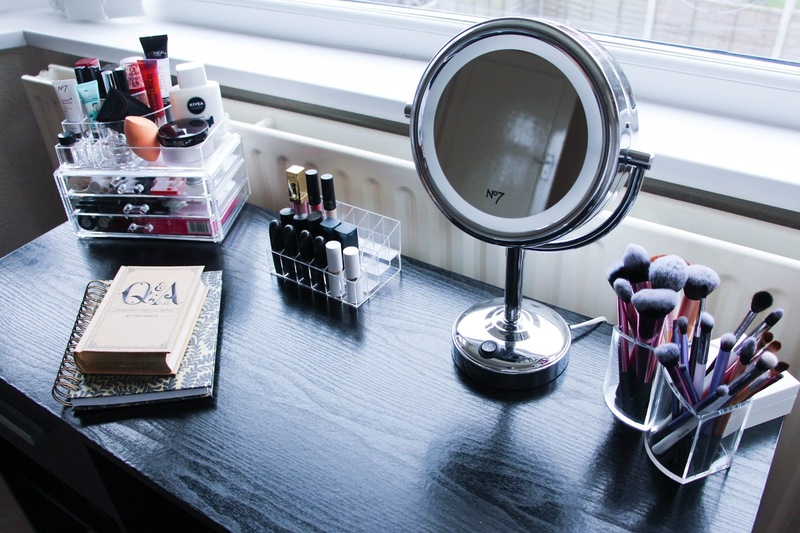 I have been trying to improve my makeup station / vanity for ages. I did the horrible mistake of buying a non washable black desk and I never thought about all the foundation, powders and other hundreds of things that falls out when I am doing my makeup. So lately my vanity has been looking quite disgusting and untidy. I wanted to share this little transformation that did not took me loads of money and maybe I will inspire you a little bit or give you some hope. 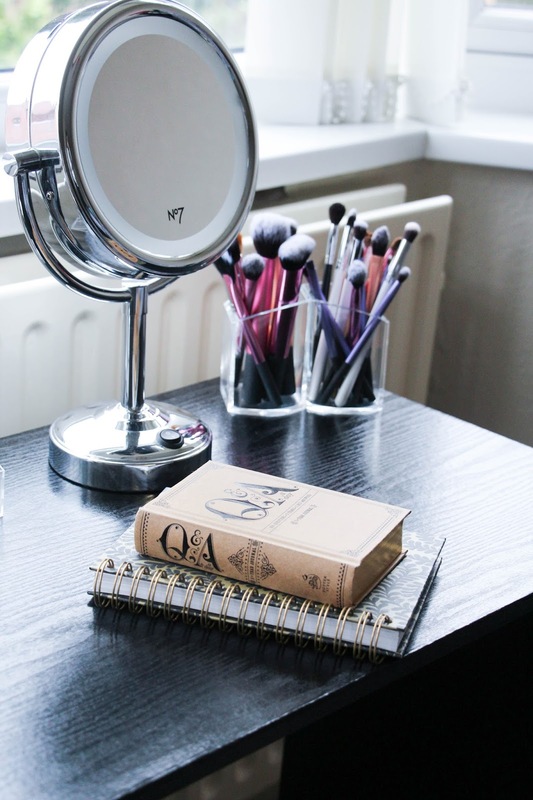 You vanity can look great if you want to. Looking at it like this it does not look horrible at all. I just felt that it was not organized, it was always dirty (can you see that big stain there? 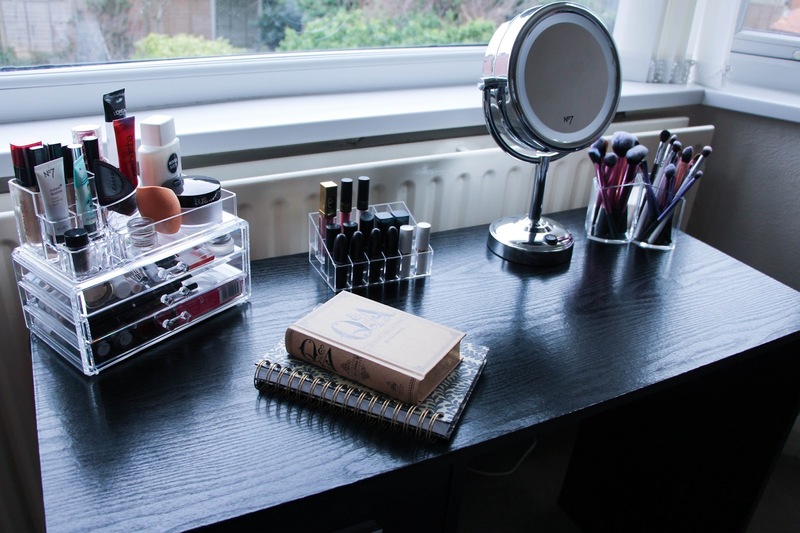 ), my brush holder was pink – something that never made sense for me – and I had products thrown around all over the place because this desk only has one drawer that is filled with eye shadow palettes and powders. So I had enough of all of this and decided to change. To start off I needed to cover those stains and that was when I thought about adhesive paper. On Amazon they have such a great variety you have no idea. Including marble adhesive paper too. I was blown away. I found a Black Wood Grain Paper Adhesive that would look perfect as you probably would not even tell that wasn’t real so I order that and looks amazing! So, so easy to apply and it just made this desk look like new. It was a great start. 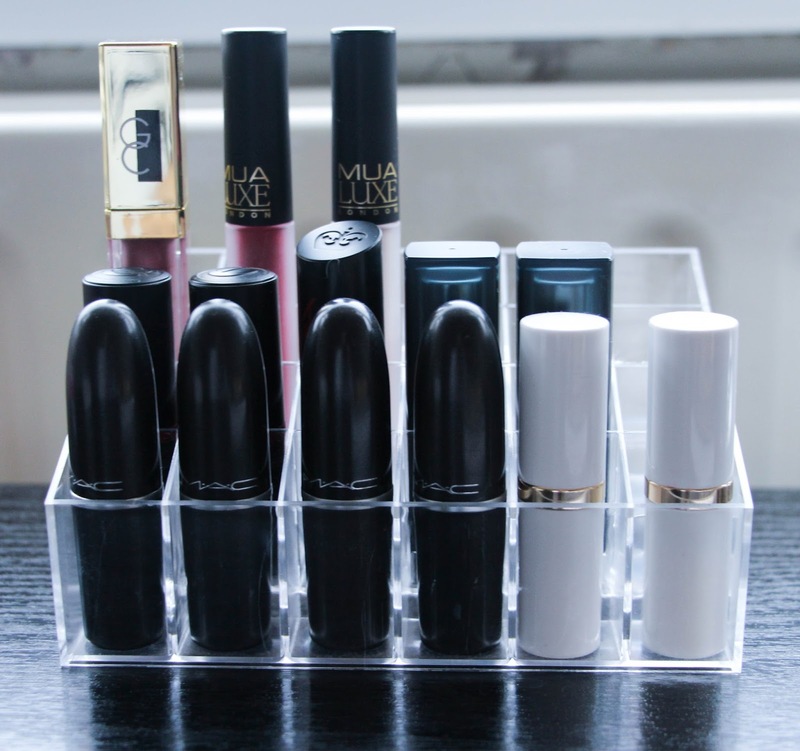 Then, for some organization a bought some acrylic makeup organizers. I already had the lipstick holder that I got from Amazon too. To be honest it is not worth that price. Although it does look good you can tell that the acrylic is cheap quality but anyways I was not up to buying another lipstick holder. This one would do! So like I said, I had a few items thrown away behind the mirror, portrait, etc. And I wanted to have a place where I could keep them without forgetting about it. 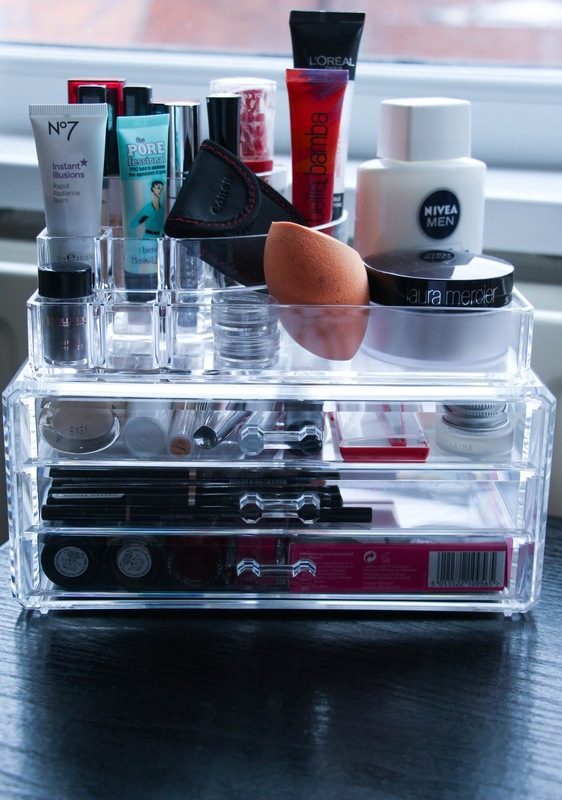 An acrylic makeup holder is the perfect idea for that! I found quite a nice one on eBay for a fair price and so I took a chance. 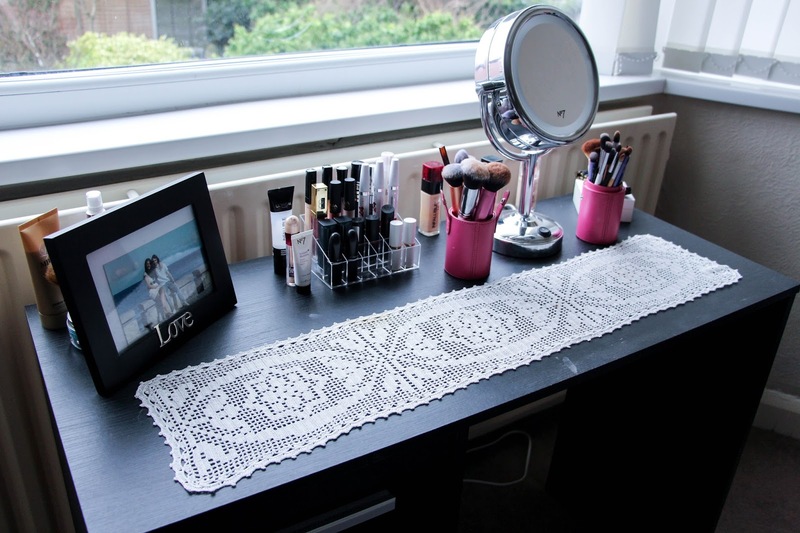 It has three drawers that are quite long but not too big – for example it does not fit my L’oreal Infallible Foundation. 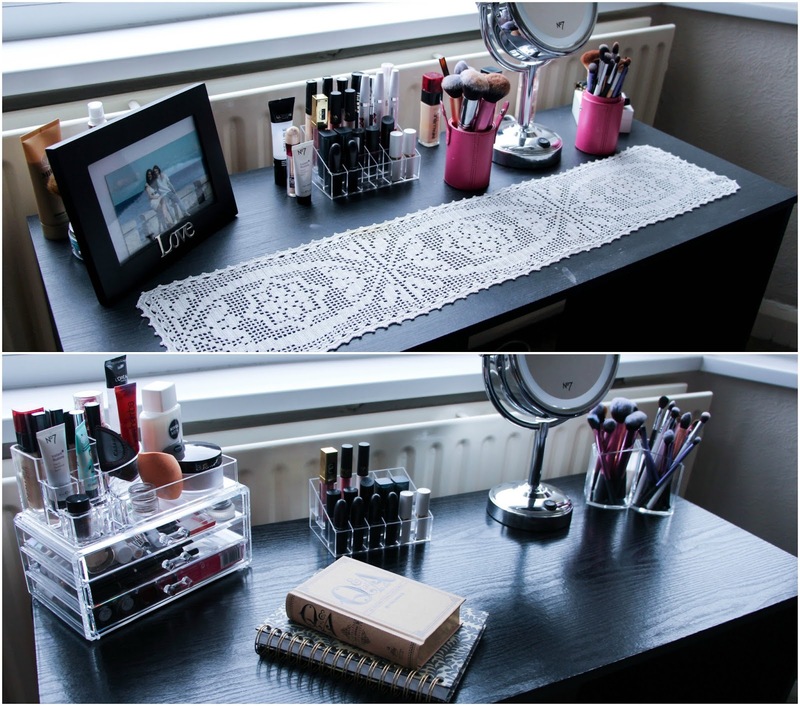 But it does the job and I managed to store a lot of my makeup there as you can see on the photo bellow. I actually love this and I think that the quality is great. 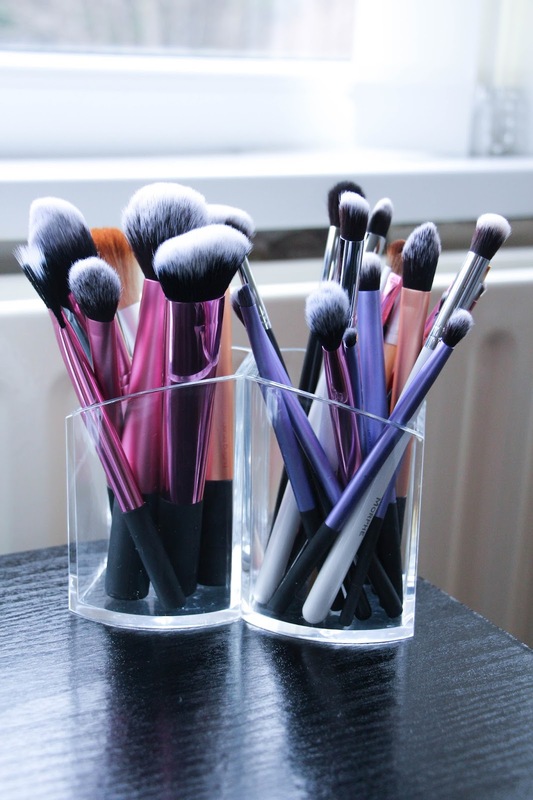 The brush holder I had previously – that pink ugly one – was one from my first every brushes that I got from ebay or something. I was starting with makeup and so I bought some cheap brushes that came with that holder. It is actually small for the amount of brushes I have now and it is pink. It doesn’t go with anything I have in my room so, what was the point? So, again on Amazon I found some Osco Acrylic Pen Holders that from the reviews said that it was great for brushes. Online they look quite small so I wasn’t sure if it would fit every brush I own but I was quite surprised when they got delivered. They are a great size for brushes, the acrylic is quite thick and strong so it won’t break so easily. I ordered two and put one against each other and it just looks perfect! It was my favorite item from all these purchases. This is the the final result! I am in love with my vanity, it looks amazing and I just want to sit there and look at it forever. Here you have some more photos.